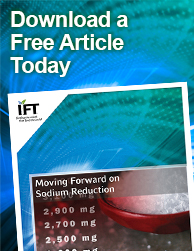 IFT’s web-based content on sodium reduction is intended to serve as resources for product developers, and academic, scientific, regulatory, and other interested stakeholders on the latest science and best practices for reducing dietary sodium across the food supply. Our aim is to elevate the role of food science and the technological innovations that are being pursued on a global basis to reduce sodium in foods and beverages. Sodium reduction initiatives strive to reduce the consumption of dietary sodium, a modifiable risk factor for hypertension—the leading cause of heart disease and stroke. Contact Farida Mohamedshah at 202-330-4986 or fmohamedshah@ift.org, with questions.